Play casino style Black Jack. A version of klondike / patience / solitaire . Sort the cards into piles in the top right hand corner of the screen. Try and get the highest score whilst doing so. Another great card game, similar to Klondike but there is no redeal. POst your top score! Get through 25 levels of fun guzzling tripeaks action and earn stars as you go along. Don't stop until you earn the prized "gold star" in all. Klondike Solitaire - one of the most popular solitaire card games in the world. 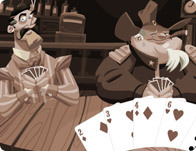 Play table blackjack in this virtual casino. Play card games with Jessica Simpson! The end of the world is a game played one card at a time! Embrace the power of the dead, read from their book and take on and take down any and all opposing magicians. Pinball Cowboy style... not much to add to description, it's pinball. Try to remove all the cards by unfolding a pair of identical cards. Monster Master plays like a trading card game, where you draw monsters from your deck with different abilities, or magic cards to help you take down your opponent's monsters and life points. Do you have card skills? Challenge yourself in this new and exciting solitaire game, do you have what it takes? The dinner party game ! Matching cards with a unique twist. Cards react to selections by shooting, exploding, and many other effects. An original video poker game. A poker game featuring wild cards. Five cards are dealt initially, and you have the option to hold from 1 to 5 of these cards and discard the rest.